HEBRON, Ky. -- Cincinnati/Northern Kentucky International Airport will become an air cargo hub for online retailer Amazon. The deal means a $1.494 billion investment and 2,700 new jobs at CVG, according to airport spokesperson Mindy Kershner. CVG will lease 900 acres to Amazon for a 50-year period. 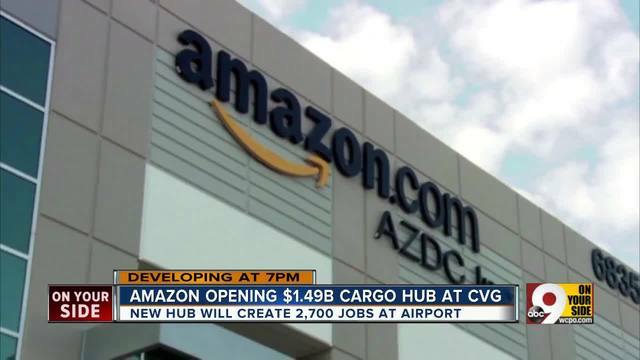 The hub will serve as a centralized location for Amazon's growing fleet of Prime Air cargo planes, according to Kentucky Economic Development Finance Authority documents. Amazon began leasing 40 dedicated cargo planes for its Prime shipping service last year, 16 of which are currently operating, according to the company. "As we considered places for the long-term home for our air hub operations, Hebron quickly rose to the top of the list with a large, skilled workforce, centralized location with great connectivity to our nearby fulfillment locations, and an excellent quality of living for employees," said Dave Clark, Amazon senior vice president of worldwide operations, in a news release. "We feel strongly that with these qualities as a place to do business, our investments will support Amazon and customers well into the future." Gov. Matt Bevin has been credited for playing a large role in Amazon's big move. Kentucky approved $40 million in tax incentives across a 10-year period. “Amazon’s Prime Air hub promises to revolutionize the fulfillment industry worldwide, and Kentucky is excited to partner with them as they embark on this disruptive, transformative and exciting venture," Bevin said in a news release. As part of that incentive agreement with Kentucky, Amazon must immediately provide at least 100 jobs paying $26 per hour, including employee benefits. The company must increase that figure to 600 jobs within six years, according to documents obtained by WCPO. Dan Tobergte, president and CEO of Northern Kentucky Tri-Ed, said that the new investment could vault CVG into the ranks of the world's top air cargo relationships, while airport CEO Candace McGraw estimated that Amazon's 200 flights each day would lower the landing fee for all commercial carriers -- a benefit that could translate into lower ticket prices and an broader array of potential destinations for travelers. "I would assume with the lower cost of operation, they will want to increase their level of service here as well," McGraw said. Amazon didn't say if it would be making any changes to its air cargo operations in Wilmington, Ohio , as a result of the CVG hub, but leaders did say they planned to offer jobs at any Amazon site in the U.S. to their Wilmington employees. Gary Moore, Boone County judge/executive, said this wuld not only be a boon for Amazon employees, but for all sorts of workers. Amazon already has a large "fulfillment center" warehouse in Hebron. Outside of Boone, they also have facilities in Bullitt, Clark, Fayette, Jefferson and Taylor counties, employing more than 10,000 across Kentucky.